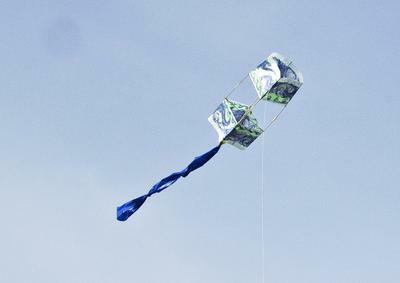 2-Skewer Box Kite - my all time favorite! The first time I saw a box kite was by way of an illustration in a book I was reading as a child. It completely grabbed my attention, and I wanted to see and know more about a box kite ever since. Well that time finally came a couple of months ago when I built my own, two skewer box kite as illustrated in Tim's book. It was the second kite I ever built since discovering Tim's website, "My Best Kite". And it will most likely remain my all time favorite – for its unique structure and lovely, dancing flight patterns. I have now flown my box kite a total of four times, with last weekend, August 24, being the most recent. I brought it to the office beach party, as I thought some of the children would enjoy it - but, back to that later. The first time I flew my box kite was in the neighboring park where I go for most of my test flights. It was quite exciting to see it immediately take off, although it took a while to get it to rise and stabilize above the erratic winds. 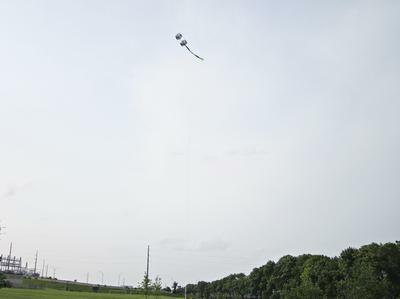 The kite was quite unstable while under 150 feet, and would do the loop to loop nose dives – almost touching the ground. But, once it rose above 150 - 200 feet, it smoothed out and flew beautifully, while staying at a low 30 degree angle. I added a tail to my kite for its second flight, (approximately four to five feet) to see if that would help stabilize it. And much to my relief, it rose smoothly through the lower turbulent winds with a more even and steady ascent. A couple of weeks later I took it out for its third and final flight. 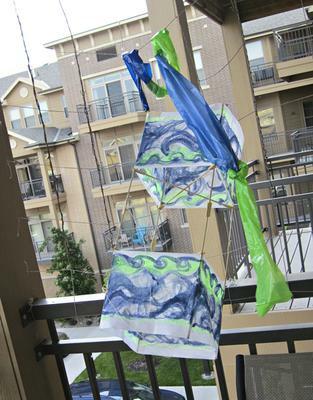 Once again I used a tail, but changed the colors to better match the kite – added some green to the blue. (The artist in me coming out). I couldn’t fly in my usual spot, as there was a concert going on, and I didn’t want my unsteady kite launch to aggravate the lounging concert viewers. The kite took off beautifully, and was so fun to watch. I absolutely love the way it angles back and forth in the wind – rising higher and higher. It reminded me of a tadpole wiggling back and forth through the water with its tail following behind. This beautiful box kite pulls hard, always on an upward ascent, and does well in strong winds (12 – 16 mph). 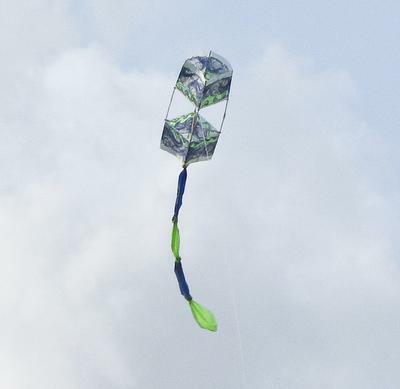 Most of the time this kite sits at a 30 to 40 degree angle, but quite often catches thermals and rises to almost a 60 degree angle and then has quite a bit of slack in the line. And then, every once in a while; it will suddenly spiral down rapidly, doing loop to loops, and scare the heck out of me as if it is going to crash to the earth. But, it always dodges the ground, and makes its way back up to where it belongs. After my third flight, I retired this kite to hang on my wall – displayed alongside my other kite creations. And there is sat from early June until just this past weekend, August 24, when I took it to my company beach party. I launched it on the lake front where the winds were quite strong and erratic, causing a rocky start, including a couple of nose dives - hard into the ground. I didn't let this stop me, as I was determined to make my box kite fly in front of the onlooking children and their parents (my co-workers). So I removed a small amount of its tail, and let it out one more time hoping for the best. Thankfully, it took off this time and rose fairly quickly, although at about 30 feet I saw something fall from the kite, and recognized it as one of the cross bars. Thankfully it kept right on flying, and made for an impressive flight. It didn’t perform as well as I had planned - often dipping very low, and not rising much above a thirty degree angle. I am sure that the integrity and structure of the kite had suffered after the nose dives, along with the missing cross bar and ripped sails (which, I observed after pulling it in). But overall, the box kite was quite impressive and fun to watch. The children had fun holding the line and even a few grown-ups took turns at managing and reeling it in. Especially when it appeared that it might crash into the neighboring pool lounging crowd. Comments for 2-Skewer Box Kite - my all time favorite! You could try shifting the flying line attachment point back a bit at a time to see if you can get any better height/stability out of it. But no further back than the trailing edge of the upper cell. Thanks for the 'eye candy' - people will really appreciate it! Return to MBK Flight Reporter Submission.